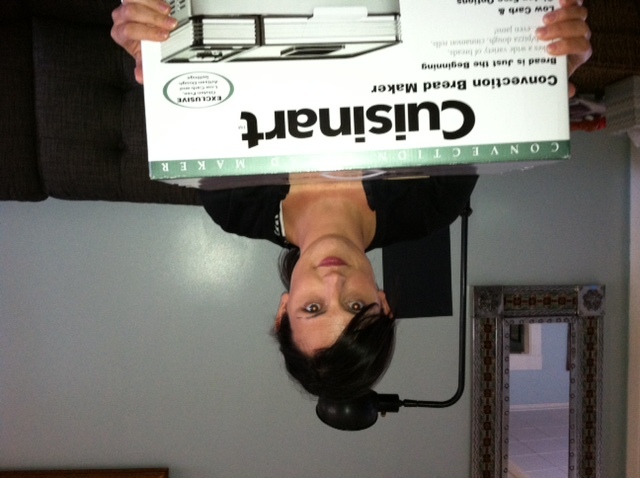 If it isn’t readily apparent by the red eyes, I’m thrilled with this convection bread maker. After all, it’s the only way I’ll ever eat fresh-baked bread again. A tear slipped down my cheek when I wrote that. But no more! I have my own bread maker, and I’m going to make the hell out of some gluten-free bread. So while Mother’s Day pasts have included spa treatments, shoes, shopping trips, this one was all about keeping mama in the kitchen. Shockingly, I did not feel one single urge to slug my husband. In fact, I’m pretty sure he’s going to get a nice, hot, reward. Called gluten-free popovers. Yes, I know. He’s a lucky, lucky, man. Seriously, anyone know where I can get a decent gf hamburger bun? Tags: gluten free bread, gluten free flour, gluten free grocery shopping. Bookmark the permalink.